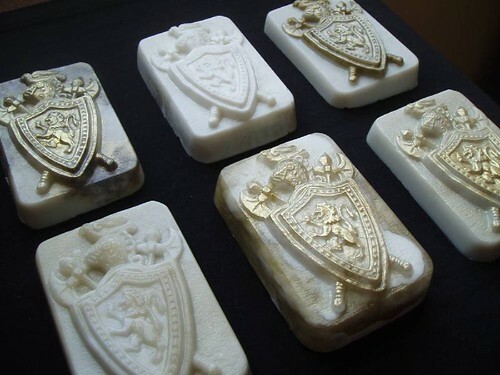 These medieval soaps were made by Debbie over at SoapyLove Daily Ditties utilizing Bramble Berry’s new Heavy Metal Gold mica. This ultra concentrated gold cosmetic colorant is a more deep, luscious gold than traditional Sparkle Gold. It’s got a hint of green and black in the blend to tone the yellow down. In a unique twist, Debbie paired the gold with white melt and pour rather than the customary clear. The effect is positively majestic. She painted the molds, dusted the soap and poured multiple layers to get these effects. You can experiment with your own creative twist and design a customized Coat of Arms based on your interests and personality. 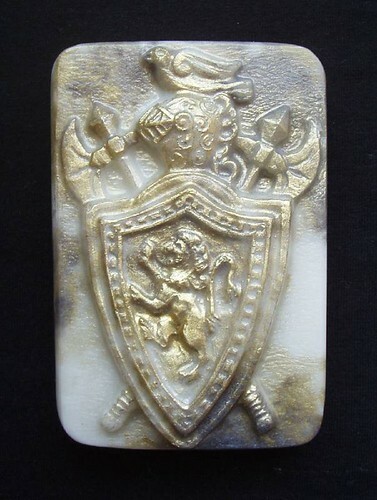 Find Heavy Metal Gold mica here, Coat of Arms mold here, and suitable fragrances (Smokey Patchoulior perhaps Moonlight Pomegranate).PS – If you’d like to meet the Artist in person, she’ll be at Otion on July 19 & 20th teaching at the Soapmaking Weekend Intensive. Wow, Debbie they look like etched chunks of marble. You are soooo creative! Quick word about the gold mica, I have been testing gold micas for soap paints for the past 2-3 months when I was sent a sample of Bramble Berry’s Heavy Metal Gold. I made one pot of paint and one batch of soap and the very same day I bought a POUND of the stuff. It really IS ultra concentrated and behaves beautifully. Thanks BB!